A heat advisory continues until 9 p.m. Wednesday in San Diego County and officials are reminding residents to take extra precautions to protect themselves as temperatures soar into the triple digits. 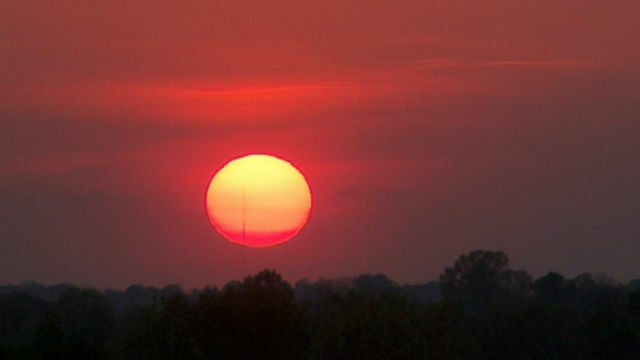 The National Weather Service excessive heat warning for the deserts has been in effect since 11 a.m. Friday. A less severe heat advisory is in place for the inland cities of Escondido, San Marcos, Poway, La Mesa, El Cajon and Santee. That advisory will also be in effect until 9 p.m. Wednesday, with the weather service predicting high temperatures in those inland valley cities of 95 to 101 degrees on Monday and 96 to 103 degrees Tuesday and Wednesday. A similar heat advisory in the mountain areas with elevations lower than 5,000 feet, which includes Julian and Pine Valley, remains until 9 p.m. Wednesday. High temperatures in those areas are predicted to reach 92 to 102 degrees over the weekend and 96 to 104 degrees Monday through Wednesday. The hottest weather is expected in the deserts, where high temperatures were predicted to reach 111 to 116 degrees Sunday, 113 to 118 degrees Monday, 115 to 120 degrees Tuesday and 114 to 119 degrees Wednesday. 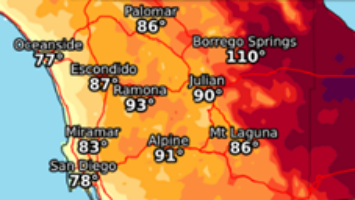 “With high temperatures expected … county health officials are reminding the public to … pay extra attention to children, elderly and pets,” county spokesman Tom Christensen said. Meanwhile authorities from the San Diego County Sheriff’s Department and Cleveland National Forest are warning hikers to use extreme caution while hiking at Three Sisters Falls and Cedar Creek Falls, a pair of popular water hikes made more appealing during hot weather. Sheriff’s Search and Rescue volunteers and deputies in the sheriff’s ASTREA helicopters have this year already responded to 24 incidents of distressed hikers at Three Sisters Falls and Cedar Creek Falls. In 2016, rescuers responded to 51 calls to those areas.